Nectarines are peaches' less-famous siblings. When it comes to the dessert course, a peach is more likely to show up than a nectarine. Peach cobbler, coconut-peach pie, peach melba, peach crumble... and the list goes on. What about nectarines? Is their smooth, plum-like skin not appealing? I have ditched the peaches (for now at least) and jumped over to nectarines this season. 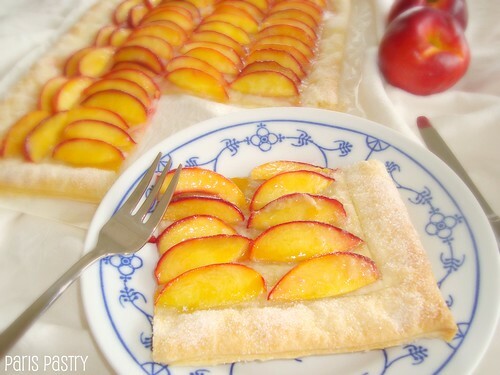 Starting with a beautiful, rustic, yet easy nectarine tart. Can you tell I like tarts?! What really makes this tart so great is the puffed-up, sugary crust. And, come on, how could anything made with puff pastry not taste fabulous? Rating: 5 out of 5. - Preheat oven to 425 degrees. Place folded pastry on a lightly floured work surface; roll out to a 12-by-14-inch rectangle. Trim edges to make even. 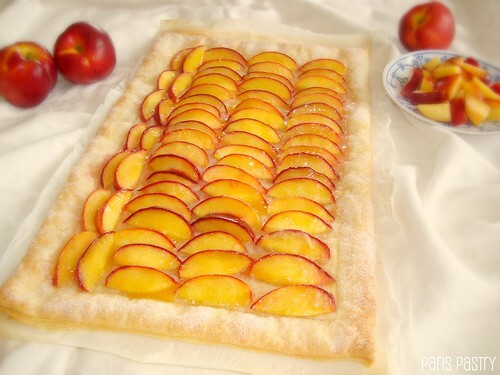 - Place pastry on a parchment-lined baking sheet. With a sharp paring knife, lightly score dough to form a 1-inch border. Using a fork, prick dough inside the border every ½ inch. Sprinkle the border with 2 teaspoons sugar. Refrigerate until slightly firm, about 10 minutes (or up to 1 day, covered with plastic wrap). - Bake chilled dough until puffed and golden brown, 10 to 15 minutes. Meanwhile, in a large bowl, gently toss sliced nectarines with 1 tablespoon flour, remaining ⅓ cup sugar, and salt. 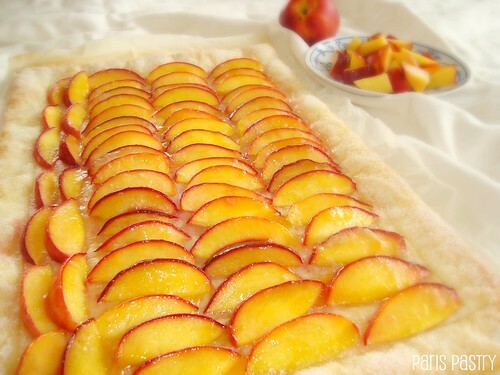 - With a fork, press dough inside border to make level; arrange nectarines in rows on top (or pile nectarines on top and then spread evenly). - Bake, loosely tented with foil, until nectarines have softened, about 10 minutes. - Brush nectarines with warm jelly. Let cool to room temperature, about 20 minutes. To serve, cut into eight pieces. Nothing rustic about that! It looks fab. 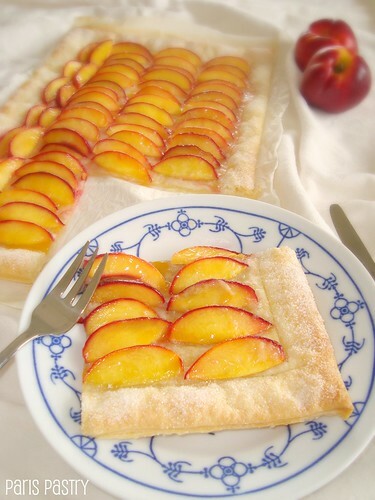 This nectarine tarte looks divine - and made with puff pastry Yum! a slice served with a goodly dollop of creme would be wonderful! It really really shows off the nectarines perfectly. Gorgeous! This is so beautiful you almost feel as if you'd HAVE to take a picture of the pretty thing on your plate before devouring it. Love how a slice of it looks very artistic with it's off-center nectarines. Love!!! I actually prefer nectarines waaaay more than peaches. SO this dessert looks perfet to me.